Collin has a genetic condition called Blau syndrome, which is so rare that only a handful of children in the United States share this same diagnosis. As Collin’s mother explains it, having Blau syndrome means that Collin’s immune system overreacts; it can’t tell the difference between good and bad, so it attacks everything. Because the best way to treat Blau syndrome is to turn his immune system off, Collin is often sick, and has spent half his life in and out of The Barbara Bush Children’s Hospital (BBCH). Collin keeps smiling though, and he doesn’t let his condition get in the way of his fundraising efforts for BBCH, his home-away-from-home! He is determined to make the BBCH specialty plate a reality, and so far, he’s signed up 61 people all on his own- including former First Lady, Barbara Bush! Go, Collin! Collin recently turned 10, and he celebrated his birthday by asking more people to sign up for the plate- check out this story from WCSH’s 207! Without your registration, we may not reach our goal. 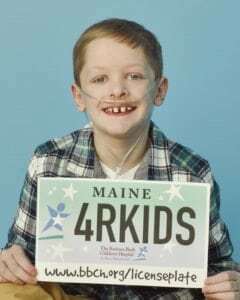 Before the State of Maine will release the BBCH specialty plate, they require 2,000 Maine residents with active vehicle registrations to sign up (with a $25 payment). Currently, we have around 1,500 people registered for the plate, so we need to gather the remaining 500 sign-ups before our October 1, 2017 deadline. We are in the final stretch- can we count on you? By signing up to help establish a specialty license plate for The Barbara Bush Children’s Hospital, you are directly making possible an initiative that has the potential to raise $200,000+ for BBCH each year for generations to come. If you haven’t yet registered, please sign up today! If you have already signed up- thank you! We hope that you’ll also encourage your friends, family, and co-workers to join you in supporting BBCH- and kids like Collin- by signing up today! Please post on your social media accounts and email your network with the link to the registration page: www.bbch.org/licenseplate. If you’d like to receive brochures or posters to share, please contact Matt Parks at 207.662.6111 or parksm@mmc.org. We appreciate your help!